Tarbet (Scottish Gaelic: An Tairbeart or Tairbeart Loch Nibheis) is a place on the south shore of Loch Nevis in Scotland, about 6 miles east of Mallaig. 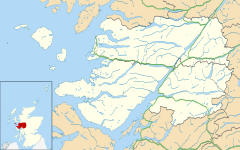 The name 'tarbet' (or 'tarbert') refers to a portage or isthmus, in this case it is between Loch Nevis and Loch Morar. Tarbet has a permanent population of 6. Tarbet is not connected to any roads, access is by a path from Bracorina, to the east of Morar. There is also a on-demand passenger ferry service to Mallaig and Inverie, in Knoydart. Wikimedia Commons has media related to Tarbet.